Found at the interior of Alaska and Yukon Territory and south along the coast to California and New Mexico along the Rocky Mountains. Elevation occurrence includes a range of sea level – 8,000 feet above sea level. It cannot grow in the shade, needs full sun and moist-wet soils. Woodland, canopy, riverbanks, stream banks, freshwater swamps, moist alluvial bottomlands, and roadside ditches. Riparian zones with wet soil and full sun. It likes heavy soils like clay. It is a pioneer or early seral species that can be found on moist alluvial soil. Flooding helps keep this species established due to its flood resistance. 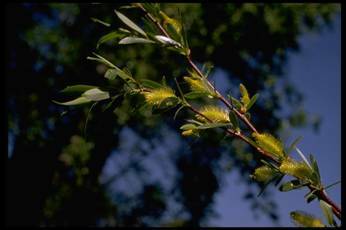 Populus balsamifera trichocarpa, Salix lutea, S. exugua, Cornus sericea, Salix boothii, S. drummondiana, Alnus incana ssp. tenuifolia, Alnus rubra, Populus trichocarpa. Seeds are very tiny, most commonly collected as cuttings. Cuttings are generally collected the same day as installation due to fast sprouting of root formations. Seeds can be collected before the capsule breaks, so frequent observation is recommended, should be around late summer, early fall. Germination is quickly accomplished with a moist seedbed. Germination will take place within 12-24 hours of reaching the moist seedbed. Light increases germination rates. Very small seed life, only 4-6 weeks when stored at room temperature. Storage can be extended to 1 month with storage in a sealed bag in the refrigerator. Vegetative cuttings are the easiest. Taking a cutting of the current year to fourth year growth is recommended. Take them in late winter, early spring (November – February). Seeds can be sown on a moist medium with adequate light very easily. Seeds can be grown on moist sand. If pre-rooting the vegetative cuttings, a mixture of 1:2 peat moss and sand that has been wetted is the best choice. Due to high sprouting of buds, vegetative cuttings are the easiest and best way for success. The key is having a wet soil. Plant approximately 1-2 feet apart. Make sure the water level is continuously wet. Vegetative cuttings like wet soils, especially clay soils. This species is a fast growing tree (2-3m in one year), but a short-lived tree (~25 years).